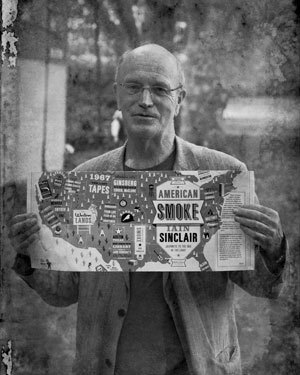 Iain Sinclair with the jacket for his new book American Smoke. In one of my favorite stories by Edgar Allan Poe, “The Man of the Crowd,” the narrator impulsively singles out an elderly gentleman and determines to follow him wherever he goes (sounds like the premise for an art piece by Sophie Calle, doesn’t it?). For most of the next two days and two nights, the old man leads the narrator on an erratic, exhausting excursion through the city of London, taking a meandering path through the high and low neighborhoods of London with no apparent pattern or goal. The way in which Poe’s narrator allows an arbitrary character to determine his path through the city can probably be seen as a precursor of the Situationists and their determination to impose similarly arbitrary ways of negotiating urban spaces in what has come to be called psychogeography. 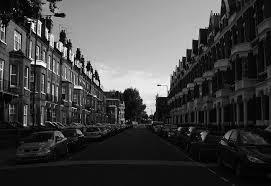 For me, Iain Sinclair’s London Orbital: A Walk Around the M25 (2004) is something of a classic in this genre. Sinclair follows the highway that encircles London regardless of where it takes him, creating a travelogue of forgotten urban corners and what Rem Koolhaas calls “junkspace.” I’ve just finished two brief, quirky books that take this tradition into slightly new directions. Both of these books parse modern urban spaces through elliptical narratives that are an unlikely combination of keen observation, untethered imagination, insider’s knowledge, esoteric erudition, and photographs. It seems to be something of an open secret in Great Britain that Jack Robinson is a pseudonym for Charles Boyle, the publisher of CB editions. 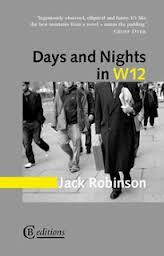 Days and Nights in W12 is an expanded version of an earlier 2009 book by “Robinson” called Recessional, part of which may be seen here. Unfortunately, there doesn’t seem to be a copy of the earlier title for sale anywhere on this planet. Erik Anderson takes a different approach to the urban environment by literally inscribing letters on the map of Denver as he takes eight carefully orchestrated walks that spell out the letters P A S T O R A L in his recent book The Poetics of Trespass (Los Angeles: Otis Books/Seismicity Editions, 2010). As Anderson moves methodically through Denver, following paths that will trace the shape of each letter on the streets and open spaces of the city, the temporal part of the walk is dedicated to meditating, questioning, and stirring together dissimilar disciplines – like poetics and urban planning – in a kind of mental trespass. “The city, like the poem, consists of a tension: how we move in it and how it moves in us.” Anderson is interested in the problem of words and the interplay between words and sound and meaning. I carved a large “P” into a medium-sized American city today. It was an attempt to inscribe language into a non-linguistic space, one in which, due to the billboards, liquor stores, gas stations and theater, temples, churches and restaurants, strip clubs, bus stops, and the Planned Parenthood office, any possibility of tracing a curve with one’s steps has been rigorous and systematically thwarted. 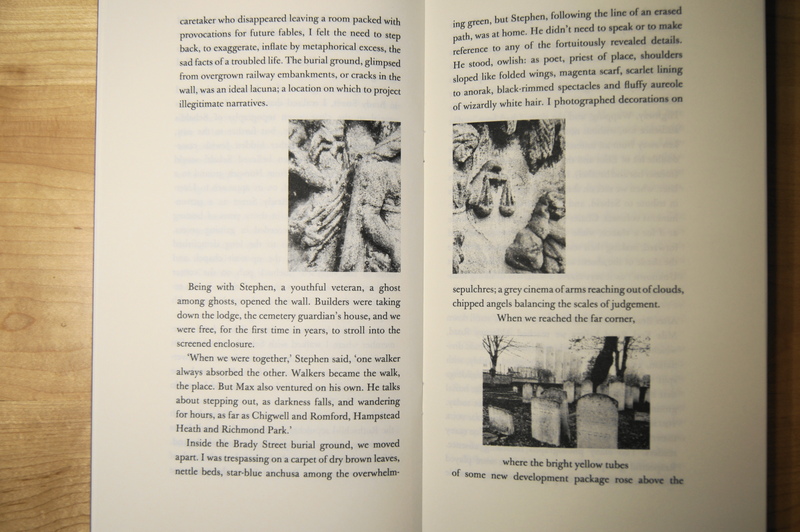 Like Robinson, Anderson also places small, self-made photographs throughout his text. His images feel less like documents than questions. The most interesting ones deal with the spatial puzzlement that arises in unplanned urban spaces and the odd juxtaposition of urban architectures. I’m not doing Anderson’s richly allusive and elusive book justice with this brief post, but there is an excerpt online, which includes several of the photographs (although the photographs in the book are reproduced in black-and-white). Tacked on after the end of the essay “The Poetics of Trespass” is another shorter essay called “The Neighbor,” on Wong Kar-Wai’s visually stunning film In the Mood for Love (2001). 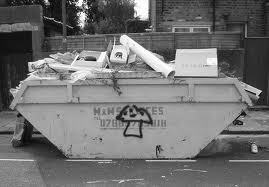 Here, Anderson plays with themes such as displacement, loss, and the nature of film. 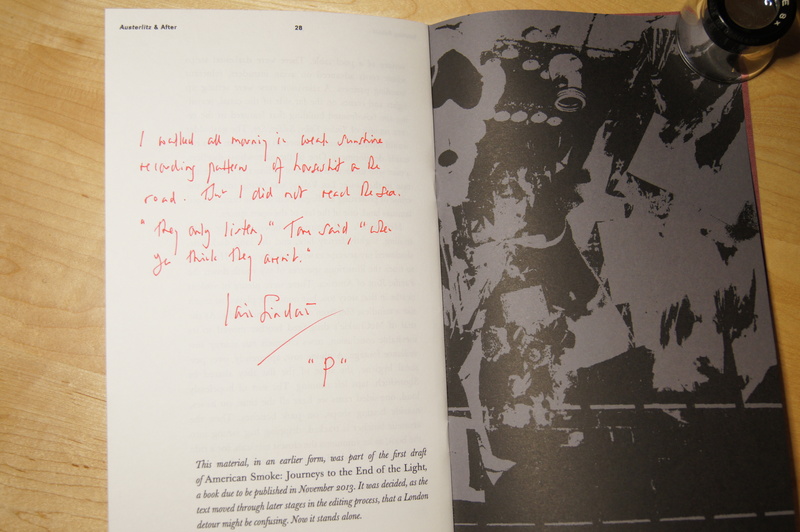 “This material,” the back page explains, “in an earlier form, was part of the first draft of American Smoke: Journeys to the End of the Light, a book due to be published in November 2013. It was decided, as the text moved through later stages in the editing process, that a London detour might be confusing. Now it stands alone.” That excerpt, Iain Sinclair’s Austerlitz & After: Tracking Sebald, has just been released as a chapbook that packs a real punch for its mere 28-pages. Wreaths, flowers, bears, cards appear, overnight, woven into the fence, above the lock where the torso was found. Yellows and purples. Deep reds and pinks. Carnations, tulips, lilies. In funnels of cellophane and twists of green paper. This tawdry story (she was murdered by her brother) helps displace Sebald from the East Anglian landscape where he lived and with which he has become inextricably identified, for Sinclair’s elegiac, almost tender, narrative is largely a tale of Sebald in urban London. 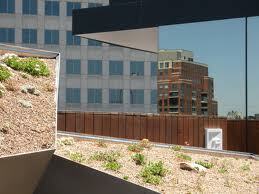 It also serves as a contrast for the way in which Sinclair wants to memorialize Sebald. As Sinclair tracks Sebald through the neighborhoods of London, sometimes accompanied by the poet Stephen Watts, he writes about places that Sebald researched and wrote about in Austerlitz. Sinclair and Watts visit places like Liverpool Station and the Jewish burial ground in Brady Street that Sebald would have seen as his Norwich train approached Liverpool Street. Watts recalls stories of Sebald’s rucksack (which became Austerlitz’s rucksack) and of Sebald trawling through shoeboxes of old postcards in Spitalfields Market. 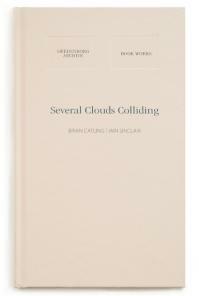 Sinclair wants to unravel the “quiet cult of managed melancholy” that has been building up around Sebald’s legend, and so he gives us a Sebald who is flawed, worried, curious, determined, ill. I wondered if Sebald ever wrote about driving. The published books present a man most comfortable with a scenario of waiting: station hotels, Swiss lakes, distant views of snow-capped mountains, flights into northern cities, walks through marches on sandy paths. Waiting for that single justifying encounter: the trapdoor of memory, the skewed quotation. the echo of a translated text. Perhaps it takes someone as eclectic as Sinclair (whose website describes him as “a british writer, documentarist, film maker, poet, flaneur, metropolitan prophet and urban shaman, keeper of lost cultures and futurologist”) to give us a glimpse of a Sebald who seems, momentarily, at least, whole. Austerlitz & After is a publication of Test Centre in London. 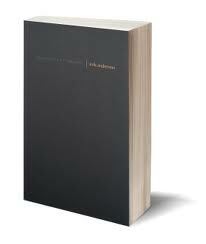 It was beautifully produced in a limited edition of 300 copies. Twenty-six copies (all now sold) were specially bound in buckram covers. Here is a view of the “extra holographic material” added to the copy which I managed to purchase.